Today IFS announced the acquisition of VisionWaves, makers of software that helps customers visualize and manage business performance from a strategic perspective by mapping, monitoring, and managing end-to-end business processes across multiple business units, data sources and applications. I feel really good about this as the acquisition completes an area where we have been investing strategically – using visualization to empower people at all levels of an organization with the insight they need in order to act and thus continuously improve business performance. In a way, you could say that we have been piecing together a puzzle over the last few years, and the addition of VisionWaves completes the picture. Think back a decade or so and you will remember that ERP applications (I use the term ‘ERP’ loosely as IFS makes solutions for asset management and service management as well) were great at processing transactions and collecting data. But they were not good at providing people and businesses with overview, analysis and insight. Sure, there were reports and the odd chart. Maybe even a dashboard somewhere. But to meet their needs many organizations built reporting schemes, data warehouses and business intelligence solutions “outside” of their ERP application. However building on the outside – often starting from scratch (which meant doing data mapping and transformation, creating data warehouses, building reports and dashboards) – clearly wasn’t optimal. Few organizations had the energy and the budget to achieve the results they wanted. Even for those who did, the insight was based on old data, available only to managers, and not in the context of where it was needed. To change anything was hard and required effort by the IT department, so many business users didn’t even bother asking new reports and updated analysis. It was the opposite of agile – what good is a report over there tomorrow when I am sitting here and need to act now? We set out to change this situation with the goal that everyone in an organization should gain insight through visualization of their part of the business, empowering everyone to make decisions that improve individual, process, and business performance. A packaged information layer with over 100 prepared star schemas, removing the work and cost associated with data mapping, modeling and transformation. Integrating a complete Business Intelligence solution with IFS Applications, providing both prepared and ad-hoc/self-service BI within the context of the IFS Applications user experience as well as from tools like Microsoft Excel. Packaged content for the BI solution, again cutting out time and cost. 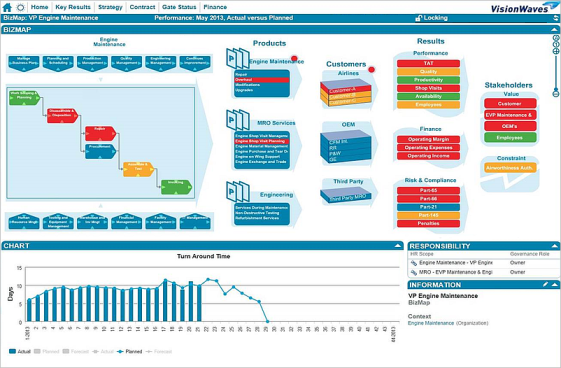 Dedicated visual applications, such as IFS Manufacturing Visualizer – providing a visual way of working (not just viewing things) never before seen in business applications. Introduced the IFS Lobby concept with the recent launch of IFS Applications 9 – providing an at-a-glance visual overview of the situation as it relates to an individual, the roles and process he or she cares about. 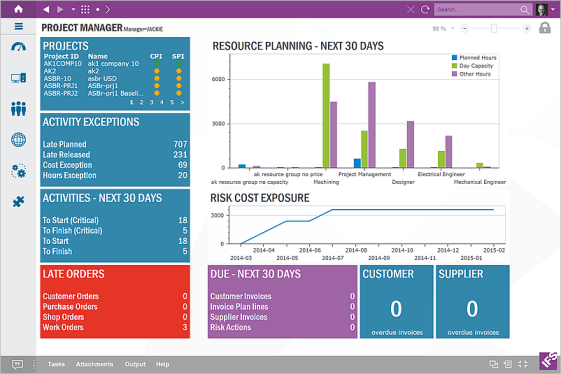 Example of an IFS Lobby page for a project manager, providing an at-a-glance visual overview of the situation. Together these things make sure that everyone in the organization using IFS Applications gets access to visual insight and situation awareness when and where they need it. The application has gone from being focused on what data you can put into it, to what insight you can get out of it. We have not yet managed to intuitively show C-levels and senior leaders how implementation of ERP supports the strategic goals of the business, and also is the key to monitoring, managing and improving overall business performance. The reality for most large enterprises is that although they continuously strive to consolidate their application portfolio, they will never get all parts of their business onto one single ERP installation. For these companies the full end-2-end processes inevitably span multiple units and also multiple applications and IT systems. 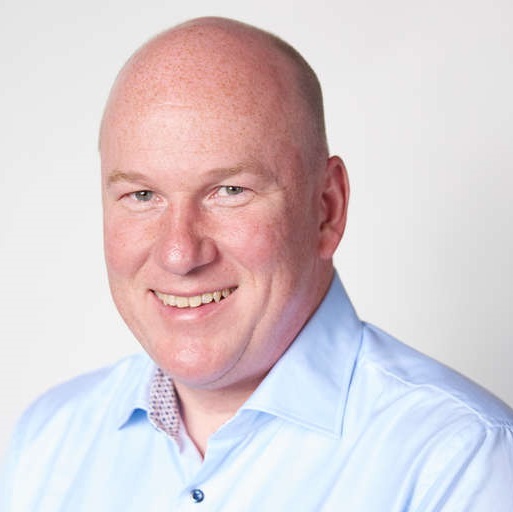 Our acquisition of VisionWaves addresses both these issues head on. Where the typical approach of ERP vendors (IFS included) has been from the bottom-up, starting with the transactional data and aggregating up to present incrementally more high-level analysis, VisionWaves uses a top-down approach. First the strategic goals, stakeholders, and key processes are modeled. Then this model is incrementally broken down and fed with live data (from the ERP application and other applications) to provide insight into how the business is performing, why certain goals are met (or not), what exactly is causing a process to underperform, and so on. This live view of a business’ overall performance is used to initiate action, refine models and processes, and optimize the business. VisionWaves starts with the top level business strategy and goals, incrementally connecting real-time data to monitor and manage the end-2-end processes. Many large enterprises use different applications for different parts of a process (for example a call center might use one application, the logistics/manufacturing a second, service a third, and finance/HR a fourth). This makes it impossible to monitor and manage the end-2-end process with analysis tools that only look at data in a single application or a single database. VisionWaves handles this by connecting to multiple data sources and integrating performance data from all of them into a single model of the business, visualizing and managing performance in a business process, and creating one common view of the truth. Finally the unique model-driven approach of VisionWaves supports IFS’s vision of making enterprises more agile and profitable in a changing world. With the model driven approach changes to how a business is modeled, monitored, and managed are done in hours and days rather than weeks and months. VisionWaves is an impressive product and I am proud to welcome the team that has built it into the IFS family. The combination of IFS Applications and VisionWaves will allow business leaders to see exactly how value is created, and help steer changes to applications as the business shifts. With the acquisition of VisionWaves IFS now has completed the puzzle by providing everyone in an organization, from the board room to the office to the factory floor, to get that instant visual situation awareness and means to act – whether their focus is on enterprise strategy and desired results, or simply which individual transactions are needing most urgent attention. The link is there, all the way from board room strategy to detailed steps of the nitty-gritty processes. As good as it is to have all pieces in place, we won’t stop here. With VisionWaves now part of IFS we can go further with integrating the two products, cutting out complexity, cost and time from customer implementations, innovating in user experience and more. We will also look to integrate VisionWaves with IFS Field Service Management. VisionWaves will have a role to play as we work to support the operationalization of the Internet of Things (IoT). With industrial IoT it becomes possible to measure and control parts of the process that were not reachable before. We have exciting days ahead of us, but today I am just excited to add the great capabilities of VisionWaves to IFS’s products.